Dr. Josh Wohlstadter is originally from Long Island, New York. 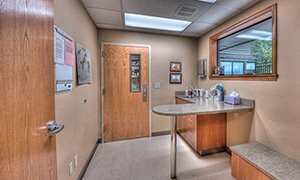 Graduating from Cornell’s College of Veterinary Medicine in 2004, he completed a one-year internship at Oradell Animal Hospital, a 24/7 emergency and specialty hospital in Paramus, New Jersey. After practicing in Manhattan for several years, Dr. Josh’s love of photography and the great outdoors led him to Albuquerque, New Mexico. While in Albuquerque, Dr. Josh met his wife, Jessica. Together Dr. Josh and Jessica have four dogs, Murphy an English Mastiff, Charlie a Standard Poodle, Tuck a Mini Poodle and Pi a Border Collie. Charlie is a certified therapy dog and loves to compete in agility, Murphy loves having his picture taken, Tuck enjoys running circles around his two big brothers and Pi is in training for Agility and Sheep Herding. 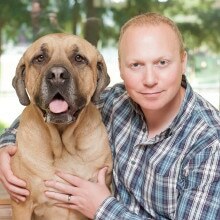 Dr. Josh has a special interest in soft tissue surgery, general wellness and the human-animal bond. With the exception of his own portrait, which was taken by his wife, Jessica, Dr. Josh took all the photographs for this web site. 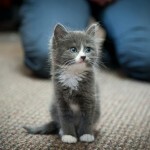 More of his photos can be seen hanging on the walls of Purdy Veterinary Hospital. 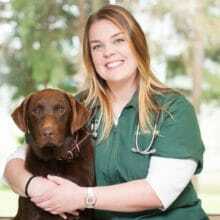 Dr. Pope graduated from Oregon State University’s College of Veterinary Medicine in 2000. 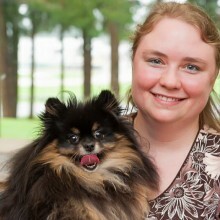 She has worked at Purdy Veterinary Hospital for over 10 years. Dr. Pope is the treasurer of the the Burley Community Club. She enjoys spending time with her daughters, baking cupcakes, international travel and she shows sheep through out the Northwest. 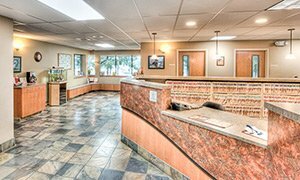 Dr. Wilson graduated from Washington State University’s College of Veterinary Medicine in 1990. 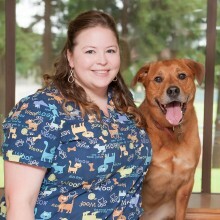 She has worked at Purdy Veterinary Hospital for over 6 years. Dr. Wilson and her husband, Phil, have two children, a son, Zach who is 19 years old and a daughter, Sabrina, who is 16 years old. Dr. Wilson considers herself a soccer mom, who enjoys arts and crafts, sewing and drawing. Dr. Wilson and family enjoy camping along the coast, attending the Folk Life Festival in Seattle and spending time with their Meyer’s parrot, Fred. 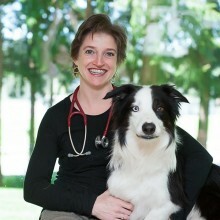 Dr. Dana Palma completed her undergraduate work and veterinary degree at the University of Wisconsin. Having been born and raised in Wisconsin, Dr. Dana and her boyfriend, also a Wisconsin native, decided to follow their love of the outdoors to Washington State. Dr. Dana is Fear Free certified and is working towards the completion of her certification in medical acupuncture, which she looks forward to using on a variety of cases, especially senior pets and those with chronic pain. Dr. Dana grew up with a Dachshund named Rusty and a Beagle named Daisy, and she currently shares her house with a buff orange and white domestic shorthair cat, named Dr. Seuss. When she is not at work, Dr. Dana enjoys camping, hiking, yoga and reading crime thrillers, especially those of James Patterson. 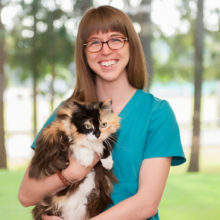 Sarah has been a part of Purdy Veterinary Hospital for over 20 years. Sarah and her significant other, Dave, live in the Wauna area. They have two dogs, Sophie, a Belgian Malinois and B.B, a Chihuahua. She also has two cats, Witty and Chubby Checker. Sarah enjoys kick boxing and is a classic car aficionado. 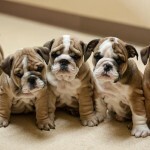 She is a huge sports fans and loves the Gonzaga Bulldogs basketball team. 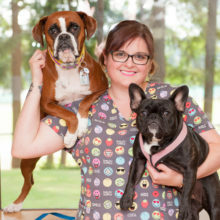 Jacqui has been working at Purdy Veterinary Hospital for over 5 years. She and her husband live on the Key Peninsula and have 3 cats and 1 dog. Jacqui enjoys backpacking in the Olympics, horse back riding and enjoys using water colors to paint landscapes. She loves English literature and her favorite artist is Vincent van Gogh. 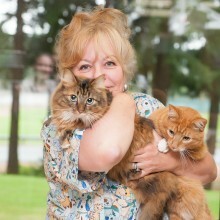 Wendy grew up in Gig Harbor and has worked as a veterinary receptionist in the area for over 20 years. Her and her husband share their home with four dogs and four cats. When Wendy isn’t working, she enjoys hiking, horseback riding, reading, watching movies, and spending time with her four (soon to be five) grandchildren. 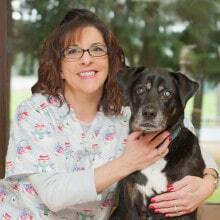 Barb has been working at Purdy Veterinary Hospital for over ten years. She has 3 dogs and 4 cats. 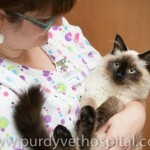 She has adopted more than half of her pets from Purdy Veterinary Hospital. Barb has two sons and a “charming” husband. She enjoys painting murals and has one of her paintings of the Purdy Spit hanging at a local restaurant. Nancy graduated in 2001 from Yakima Valley Community College. 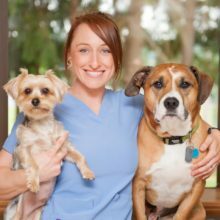 Her grandmother, who was also a veterinary technician, inspired Nancy to follow in her footsteps. Nancy and her husband Joe have a 4 year old daughter Alexis, and their 4 legged children include a chihuahua and 4 cats. Nancy enjoys hiking, camping and off-roading in her Jeep. 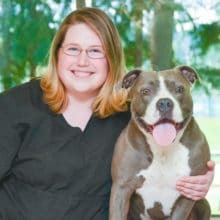 Tiffany, a graduate of Pierce College’s veterinary technician program, was born and raised in Gig Harbor. When she isn’t taking care of her patients, Tiffany enjoys baking cupcakes and hiking on Mount Rainier. Together with her husband, Travis, they own three, mixed breed dogs, named Bubba, Lucy and Junior. Erin was born and raised in Gig Harbor, WA. 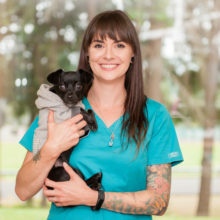 She is a graduate of the veterinary technician program at Pierce College. She has two dogs, Trip and Riley, a Pitbull mix and a Yorkie. When she is not at work she enjoys, hiking, fishing and anything outdoors. 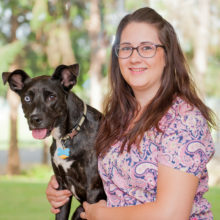 Jaime is a graduate of PIMA’s veterinary technician program. 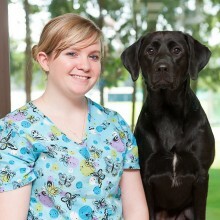 She enjoys all aspects of veterinary medicine, especially dentistry. 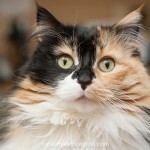 She lives on the Key Peninsula with her husband and two dogs, Duncan, a Chihuahua mix and Yoshi, a Labrador Retriever. She also has a Ball Python, named Nani. When Jaime isn’t at work, she enjoys painting, photography and gardening. 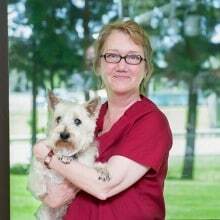 Marsha has been working at Purdy Veterinary Hospital for over 20 years, longer than any other staff member. She has four dogs, including two Irish Setters, one Pointer and an English Cocker Spaniel, one cat, two guinea pigs and a Tennessee Walker horse. She has participated in the conformation ring with her Irish Setters and she loves dog sports, having competed in agility, obedience, tracking, and hunt and field trials. 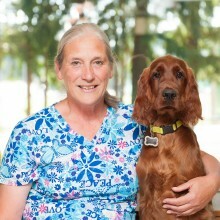 She has owned one of the top obedience Irish Setters and has bred some of the top performing agility Irish Setters. Marsha enjoys horse back riding and camping near the ocean. Deena’s parents, friends and family knew from a young age that she would always work with animals. 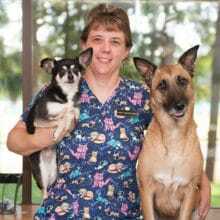 She graduated from Pierce College in 1998 and started work at Purdy Veterinary Hospital in 2001. She has a Boxer named Hootie and a beta fish named Alpha. She enjoys sport bike riding, karaoke, & traveling. Marie is from Port Orchard, Wa. 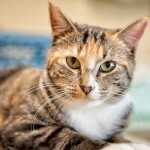 She volunteered and worked at the Kitsap Humane Society for several years before joining us at Purdy Veterinary Hospital. She enjoys camping & hiking, as well as spending time with her labs, Zoie and Lincoln, her cats Zora and Onyx, and her husband, Travis.